Pellicci's is a classic example of fifties post-war cafe and a slice of East End history. The art-deco interior with wood-panelled walls which date back to 1946 is so 'of its time' that its Grade II listed, cited as an "increasingly rare example of intact and stylish Italian caf that flourished in London in the inter-war years". This pocket of history of East End history is where locals - including the Kray brothers - have been coming for years. You can see them greeting owner Nevio Pellicci on first name terms - he's 'Nev' to friends and regulars. 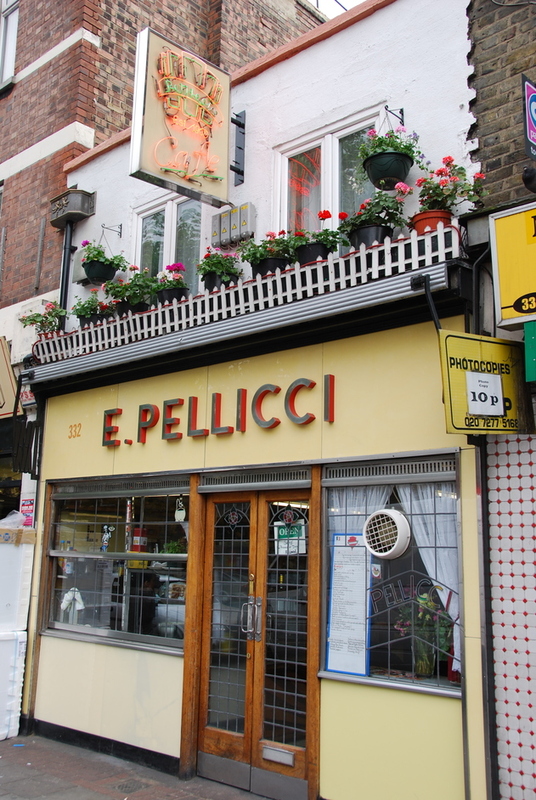 A true family business, Pellicci's has been in the same Italian family since it was built in 1900, Nevio was born above the shop 79 years ago and Nevio's son, also called Nevio, and his daughter also work in the cafe. Breakfasts are classic greasy fry-ups served with fat chips, eggs, bacon and beans. For lunch the homemade steak pie and 'Italian Ribena' will keep you going till tea time. The antithesis of chain coffee shops that are taking over the high street. E Pellicci gyms, sporting activities, health & beauty and fitness. The best pubs near London E Pellicci. E Pellicci clubs, bars, cabaret nights, casinos and interesting nightlife. Where to have your meeting, conference, exhibition, private dining or training course near E Pellicci. From cheap budget accommodation to luxury 5 star hotels see our special offers for E Pellicci hotels, including Ace Hotel London Shoreditch from 84% off.